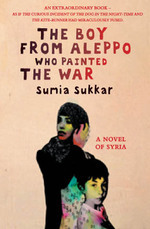 Earlier this year, The National’s John Everington interviewed British author Sumia Sukkar about her first published novel, The Boy from Aleppo Who Painted the War, which is distributed by Guernica Editions. Sukkar spoke about the experiences which influenced the story and about the development of the novel’s complex narrator. “Originally in my head Adam started off as a normal child,” she says. “But I wanted to give him more of an edge as a narrator. The Boy from Aleppo Who Painted the War draws on first-hand experiences of Sukkar’s family and friends. The Boy from Aleppo Who Painted the War has been dramatized as a radio play by the BBC.